Top 4 Courses for Dads Jun 14, 2018 All our courses are suitable for dads and non-dads alike! But with Father's Day right around the corner, we thought we would put together the four courses w.. Mechanics Course Online: Learn the mechanics behind the maintenance and repair of machinery. This distance learning course is not only relevant to cars. It is relevant to any machine with an engine or a motor, including those found in the home. Gain an understanding of how machines work, so that you can undertake servicing and repair jobs yourself. This is an ideal course for DIY Enthusiasts and a great foundation programme for apprentices either working in or wanting to work in the service and repair of cars, farm machinery, home appliances, lawn mowers and many others. Machines have become so much a part of modern life that we can easily take them for granted. Most people don’t even give a second thought to how the machines they use are functioning; that is until they stop functioning. Learning more about mechanics can enable you to do so much more with machines though, from using them more appropriately and safely to maintaining and repairing them when required. Some machinery is relatively simple and easier to learn about, but other machines can be much more complex and will require far more learning and experience to properly understand. This course is the cornerstone for understanding and working with all machines, each lesson building upon what you learnt in the previous ones, gradually expanding your awareness and understanding of how and where engines can be used to power machines, and how different types of machines function. Explain how different types of engines and motors work. Describe the features that differentiate the quality and work capacity of engines; one from another. Describe the scope and nature of components of a machine. Explain different ways of converting the movement of energy to perform useful work tasks. Describe how machinery can deteriorate over time, and responses to both prevent and repair deterioration. Explain how engines and motors have their power output regulated. Explain the mechanisms used to slow or stop any form of motion by applying force. Describe machinery workshop tools and equipment, and explain their safe and appropriate use in maintaining and repairing machinery. Describe some routine machine maintenance and repair tasks. Engine Efficiency: How Does an Engine lose Power? Any piece of metal, regardless of how smooth and polished it may look to the sight or touch, is covered with tiny irregularities and projections. When two highly polished metal surfaces are brought together, and one forced to slide over the other, the projections grip each other, causing resistance to the sliding. This resistance is called FRICTION. Friction results in wear of the metals. The amount of friction depends on the type of material, amount of pressure and the nature of the surfaces. 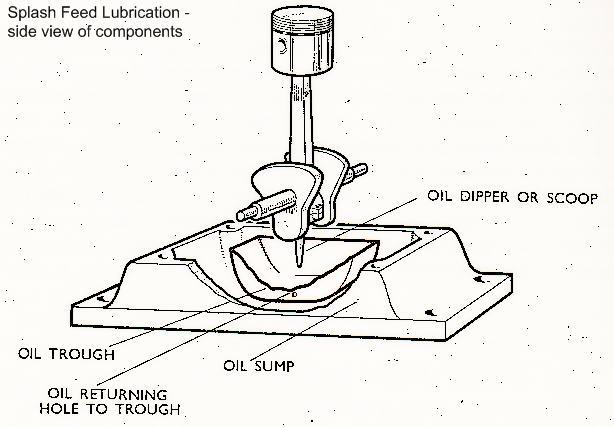 Lubrication reduces friction, and this occurs when some substance, either liquid or solid is put between two rubbing surfaces. Lubrication also reduces wear and heat that would otherwise occur. The lubrication system must distribute the lubricant so that at no instance is there metal to metal contact in any moving parts. 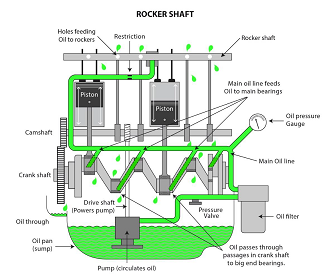 There are different types of lubrication systems, for different types and sized engines, e.g. 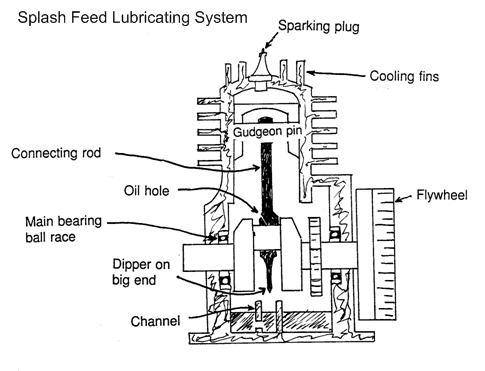 the splash feed system (see diagram below) and the force feed system. Although the lubricant acts as a coolant, some sort of cooling system is also necessary in an engine (cooling methods are discussed in the following section). Oil contamination can occur so it is necessary to change the oil regularly, after a certain number of operating hours. Moisture contamination can occur in an engine due to condensation and also as a result (by-product) of the cooling process itself. Dirt may enter through the air intake of the engine, so it is important to regularly change or maintain the air filter. Tractors, particularly, operate in very dirty environments and for this reason they are fitted with a special mechanism called an oil bath air cleaner. Carbon and soot by products also cause oil contamination. When a motor or engine is operating it produces a significant amount of heat. To prevent damage to the engine it is necessary to keep the engine at a correct temperature. Operating an engine at overly high temperatures causes structural damage to engine components, and overly cool operating temperatures mean the fuel will not vaporise properly. The two main methods for cooling engines are air cooling and water cooling. Air cooling is mainly used in small engines (single cylinder) or for machinery like potato harvesters, lawn mowers and elevators. A blast of air is directed on the cylinder and cylinder head, both of which are finned (see diagram below). These fins increase the surface area of the cylinder and provide a larger surface area through which the heat can spread. Air cooled systems are simple and reliable, but are less efficient than water cooled systems as air has a lower heat capacity, so more air is needed to produce the same effect as water. Over-heating can occur if the fins become blocked with dirt, as this reduces the surface area to be cooled. 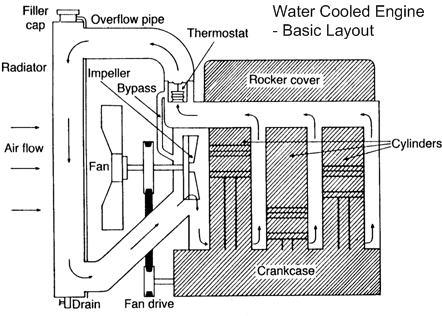 Water cooling is more effective for use in multi-cylinder engines. The engine cylinders are completely surrounded with a water jacket. The water extends to the cylinder head where there is an outlet to the radiator. There is another outlet at the bottom of the radiator connecting back to the water jacket surrounding the cylinders. Water flows around this system. The radiator is composed of a head tank and a bottom tank. Between these there are a lot of thin tubes and metal plates that greatly increase the surface area to be cooled. This is the core of the radiator. Behind the radiator core there is a fan that operates via a pulley system connected to the crank shaft of the engine. This fan blows cool air onto the radiator. The cooled air circulates back through the engine.